Love this picture! I hope that's me and my husband in about, oh, 40 years or so. Nice capture. It has a good feeling. Together, in the journey called 'life'. They are so sweet! When I see a couple like that, I always tell Carl that's us in a few years. So sweet, I love that they're holding hands. That is precious. That will be Robert and I someday! Awww, isn't that lovely! I hope we're still holding hands in 30 years! I can see they've learned a lot over the years. Good shoes, for one thing. Awww, cute :-) they look like they're on vacation. 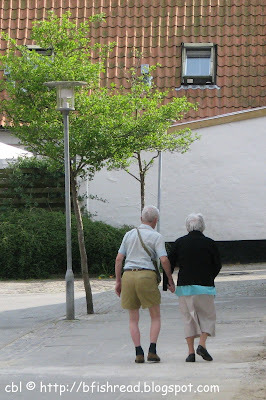 I love to see old couples like that, holding hands as they walk. What a cute couple!!! Great pic Beth (as always). That is my husband and I! Not really. My hubby's calves are a bit sturdier, but we're not much younger than the couple in the picture, and I can tell you that we're still having fun. Especially when we get to travel! That's so sweet!! Great capture. That's just how my love and me want to be in the (not too distant) future. Aww, how adorable are they?! How sweet! Hope you visit my Wordless Wednesday. Interesting picture; looks like the ending of a great film. Wonderful picture. They make me smile. This is a great photo:) I can't believe it is already Wednesday! Just wanted to drop a note letting you know you won the You've Got Mail dvd giveaway. Do stop by when you get a chance and congratulations! I'm feeling that love. Beautiful shot. A beautiful picture with a beautiful message! such a beautiful pic Beth. I hope to be walking hand-in-hand with J at that age/stage! Something to shoot for. Except in our moment in the future, I'd be standing there trying to take a photo of something and Andy would be standing off to the side with his hands on his hips waiting for me to hurry up.